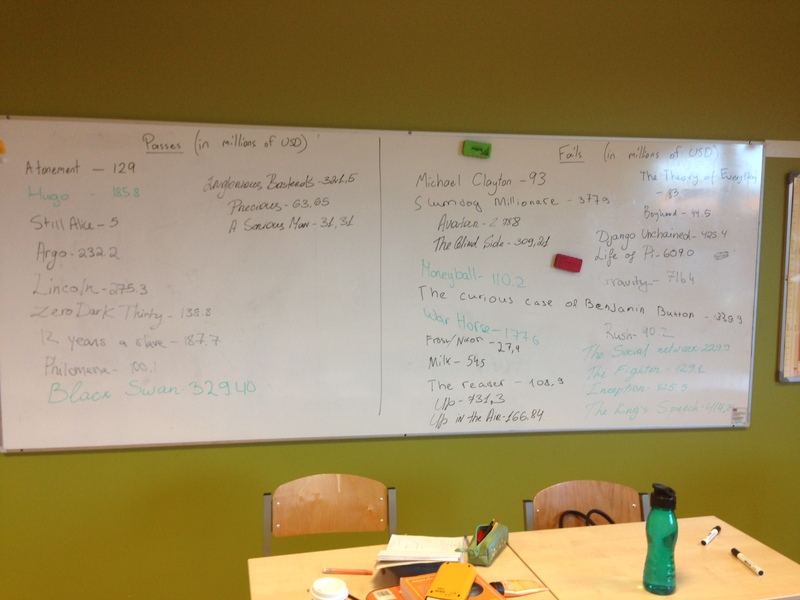 My grade 11 math class needed some practice work cumulative frequency graphs [CFGs], and I wanted to go through the steps of developing a stats research project, so I decided to get the students to create a cumulative frequency graph involving box office gross for movies. However, as we were discussing how we’d collect data, one student brought up the poor representation of women in films, which led to the Bechdel test. Thus, we changed tack, and made a pair of CFGs — one for movies that passed the test, and one for those that failed. Above are the films we selected (Golden Globe nominees for best motion picture, drama, from 2008 to 2015). I’m looking forward to seeing the analysis, and discussing implications, tomorrow! This entry was posted in Uncategorized and tagged bechdel test, gender, math, statistics on February 24, 2015 by Danny. Today, we figured out which features of functions are essential. Lots of small, vital lessons in here. One student drew a graph, one student tried to replicate it without seeing it, and two others described the graph mathematically to the replicator. This entry was posted in Uncategorized and tagged functions, graphing, math, sketching on February 3, 2015 by Danny. This year my school obtained a lease on an overgrown orchard adjacent to our back yard. The new land has offered a number of great opportunities for instruction. 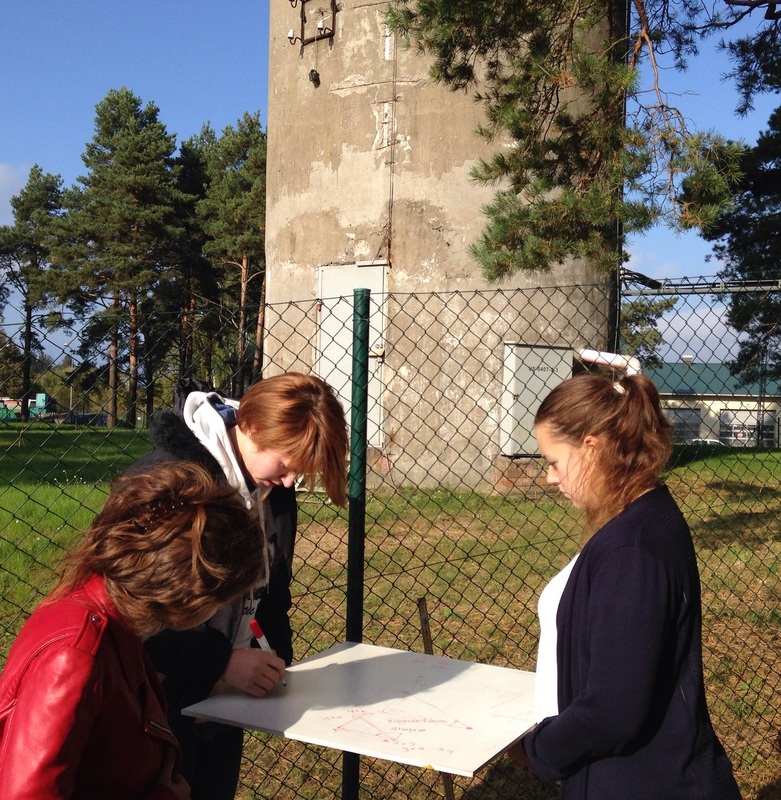 A disused water tower, located a couple meters past the new rear gate, has piqued my attention this week. Today, I took my grade 12 math class down to the tower and asked them to determine the height of the small platform you can see near the top. We brought along a meter stick and a white board. 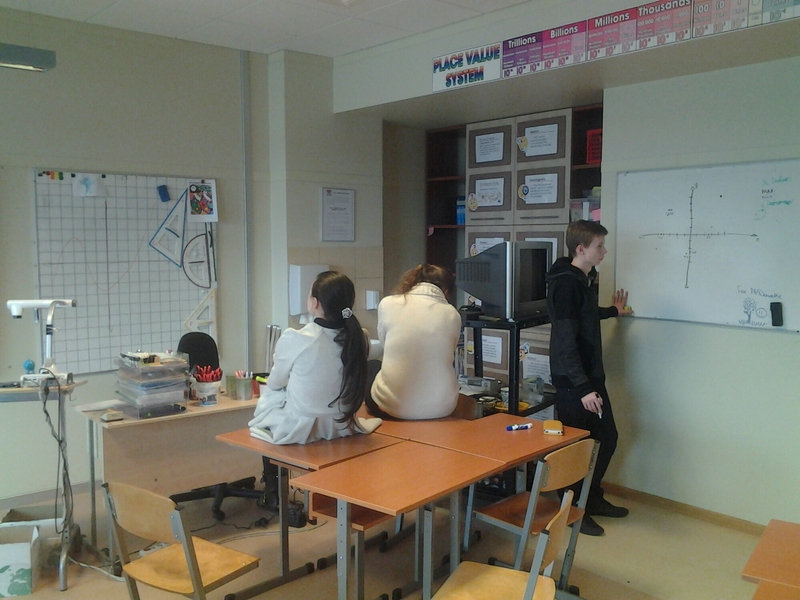 The students decided to think of the challenge in terms of coordinate geometry. They were able to define the problem, draw the indicated line, and outline a solution: determine the equation of a line-of-sight between someone on the ground and the platform. Unfortunately they got stuck at this point, and I needed to remind them that they could use two points to define a line — that was enough for them to establish a procedure whereby one sighted the platform while sitting, and another moved about until the top of her head was in the line of sight of the sitting student. The students took characteristically incautious measurements, so I went back and re-did the experiment myself. Here is a photo from my attempt. 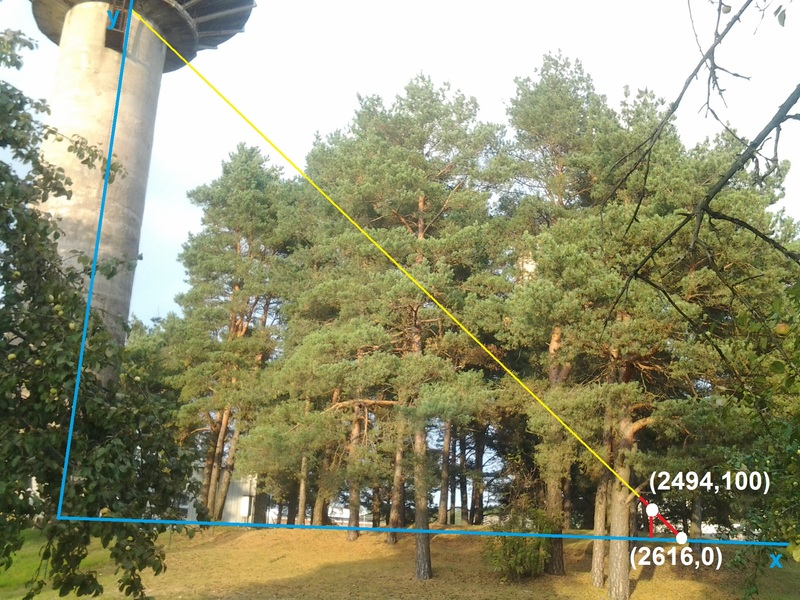 This entry was posted in Uncategorized and tagged coordinate geometry, math, modelling, water tower on September 26, 2014 by Danny. The director of my school sent along another article about how math teachers should be showing kids the beauty of mathematics. It’s an argument that is being made widely: I’ve seen it in the NY Times, in Frenkel‘s wonderful Love & Math, and in the education literature. The structure of the argument is to draw a metaphor to the fine arts: kids love music/painting/film because they get to experience Beethoven/van Gogh/Spielberg. Math also has some beautiful pieces, so why don’t we show those to students, and they’ll love math, too? Of the beautiful aspects of mathematics, what is accessible is often trivial, and what is profound is usually inaccessible. For example, Noether’s Theorem is a beautiful connection between symmetries in nature and conservation laws in physics — but explaining it is beyond the scope even of a top-notch Calculus 101 course (here’s my attempt). Beautiful and meaningful, but inaccessible. On the other hand, the proof that there is no highest prime is accessible to a high school student: but in my experience, students say, “meh”. Accessible, but not profound in their cosmologies. There are plenty of sources of beauty in the world. Depending on your school system, these might all fall under the purview of the art department. Or perhaps (like fire-dancing, electronic circuit design, and sunset-watching) your school doesn’t feel a responsibility to teach students about every conceivable source of beauty in the world. Math has a unique position in the educational ziggurat because of its value in preparing students for STEM-related careers. If we wish to push math as primarily an aesthetic enterprise, we must reconsider its usefulness: does a knowledge of group theory prepare students for the knowledge economy better than the ability to draw freehand? I think the analogy with the fine arts is a poor one. A much better comparison can be drawn with the subject that is sometimes known as “English Language Arts” or, less precisely, Literature. A couple decades ago, we started moving away from teaching English through rote grammar recitations. Instead, there is a focus on reading and responding to authentic texts, with a great deal of freedom given to the teacher to choose the material. A cynical view is to say that the only meaningful outcome of these courses, nowadays, is the ability to write essays. Compare with math, which is stuck in the “grammar recitation” era. Both mathematics and communication are deemed essential, yet the latter was allowed to evolve according to progressive ideals of education, which the former stagnated. Just like the fine arts above, and math, literature has elements of deep and meaningful beauty. For high school students, connecting with these is rare (required readings rarely bring about the emotional response intended by the teacher!). Like math, high school literature eschews the cheap beauty of the fine arts. So what would need to happen for a high school math curriculum to work in the same was as an English Language Arts scheme? First, administrators would need to trust math teachers to construct a meaningful scheme of study. Second, math teachers would need to up their game dramatically: no more reliance on worksheet, textbooks, and answer keys. Third, the support infrastructure would need to build resources for active math learning, including a system to track and monitor prior learning (Salman Khan‘s vision of math education comes to mind). But perhaps most importantly, we would need to accept that high school math does not serve the needs of the majority of the students who study it. The benefits of math education dry up some time during middle school, for students who learn the curriculum the first time through. Advanced levels of numeracy, of the sort that we will require for future citizens, are as likely to emerge from the current pedagogical morass as 21st-century communication skills would be derived from grammar worksheets. So here’s my response to these calls to teach the beauty of mathematics: don’t teach it, but let it serve as a guide. Use emotional touchstones to drive the curriculum. Let’s demand the same high level curriculum planning from math teachers that we ask of English teachers, and let’s give them the freedom to do so. The alternative is not teaching budding artists brush strokes without ever seeing a masterpiece: instead, the alternative is teaching budding poets by doing nothing but close-reading sonnets. This entry was posted in Uncategorized and tagged bad analogies, education reform, math, math as art, rambling posts on September 17, 2014 by Danny. One of the new ideas I encountered through modeling is the practical summative assessment. It seems like a great idea to invigorate the learning process, make testing meaningful, and still maintain high expectations. 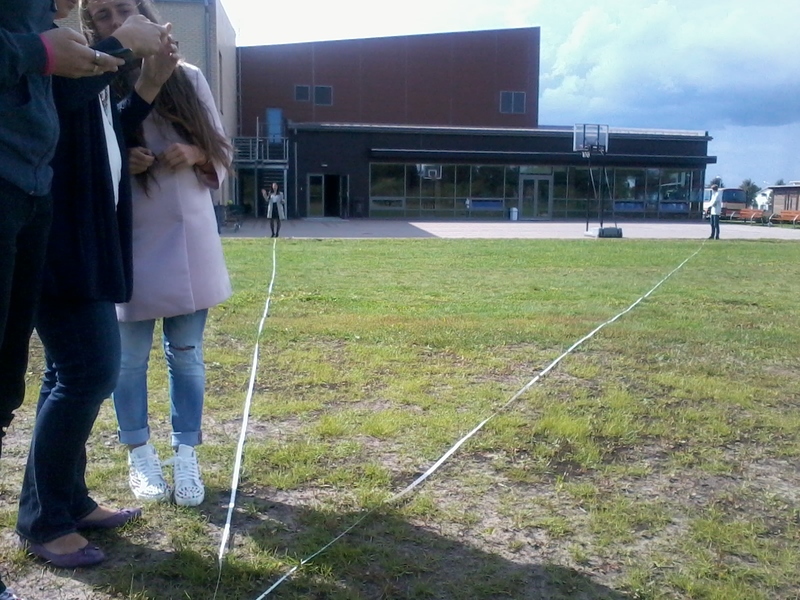 My grade 12 math class is doing a bit of review of geometry, and the Pythagorean theorem in particular, so I took them outside for an activity. I marked off a 14 m segment at the edge of a pavement. The students worked in groups to create a straight line that forms an angle of exactly 90 degrees from the edge of the pavement. The solution, of course, required the construction of a large right-angled triangle. 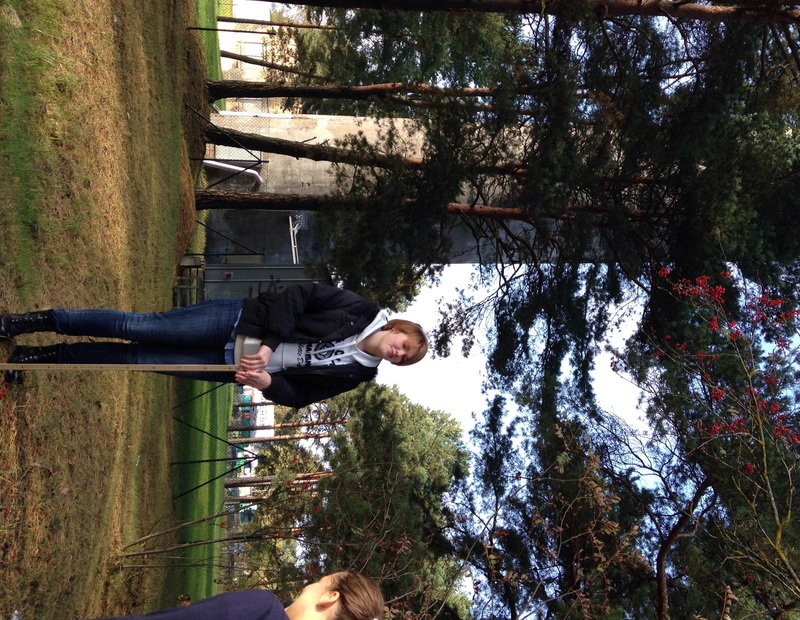 The students used two 30 m measuring tapes to build the other two sides of the triangle. Activities like this require multiple hands — at least three students per group — which usually leads to one student taking over. Thus, I had the groups do this activity in a couple iterations, requiring rotation of responsibilities. 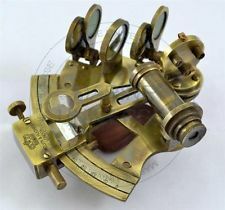 I liked that I was able to tie in the etymology of geometry by giving some historical context: we were land surveyors on the Nile floodplains, calculating the Pharaoh’s taxes. I’ll try more assessments like this in the future. This entry was posted in Uncategorized and tagged geometry, math, outdoors, pythagoras on August 23, 2014 by Danny. The Infinite Monkey Theorem [IMT] states that a sufficiently-large number of monkeys, randomly hitting keys on typewriters, will eventually reproduce the works of Shakespeare. It’s an “order hidden in chaos” claim as old as history. Let’s ignore the problems with using monkeys (ie: intelligence, low output, boredom, etc). Mathematically, the IMT relies on the monkeys providing a random string of characters. The likelihood of a given string corresponding to a known text (ie: Shakespeare) is very, very small — but not infinitesimal. Thus, if you wait long enough, the probability will grow until you can be reasonably confident a certain string will be produced (however, after no amount of time can you be 100% sure — just as after no number of coin flips can you be completely sure you’ve gotten at least one tail). What I find interesting, and overlooked by most people who hear about the IMT, is how quickly the numbers grow. 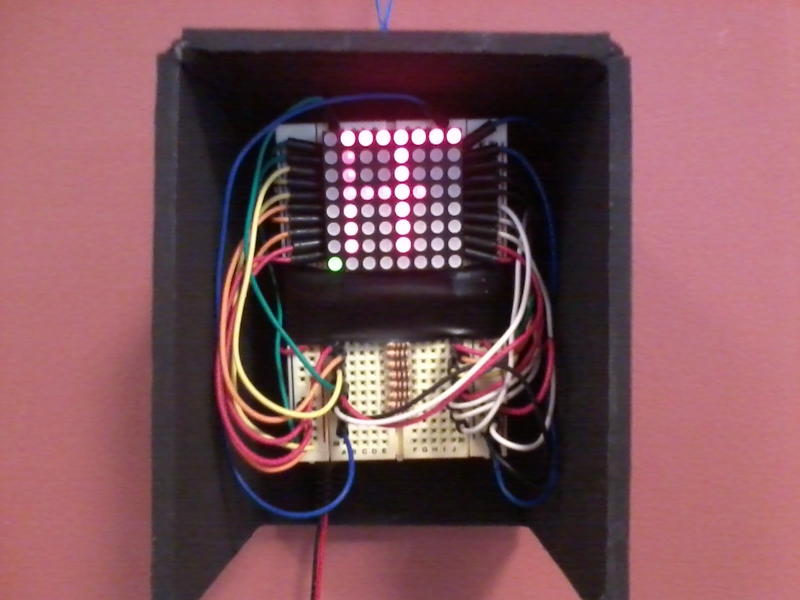 To bring these issues to light, I used an Arduino and an 8×8 LED matrix to simulate a monkey. 5 times per second, a letter is randomly chosen and drawn. If the string of letters matches the string “TOBEORNOTTOBE” (“to be or not to be”, the display pauses and green LEDs at the bottom of the display indicate the number of letters in the string that match. In the above image, the letter T has just appeared, and the single green LED signals that there is a one-letter match. You’d need to wait an one hour (on average) in order to see the string “TOB”, and about a day (on average) to see “TOBE”. The 19-character string, “TOBEORNOTTOBE” will come along on average once every 10 000 million million years, or a million times longer than the age of the universe. The full text of Hamlet will take a bit longer. This entry was posted in Uncategorized and tagged arduino, gadget, infinite monkeys, math, probability on January 21, 2014 by Danny. In my view, empathy is the most important skill we should be teaching students (see Jackie Gerstein’s excellent post). In the IB program, doesn’t “internationalism” just boil down to empathy + geography class? Here’s the idea: give each student some seed money to start and run a charity. This can be connected to class content by requiring a business plan, promotional materials, a mission statement, a cash-flow model, etc. It might be best to hold on to the cash until the students have laid all the groundwork. Set up an after-school art program for local kids, and sell their work to tourists during the summer. I think that a bit more time would have streamlined and fleshed out these ideas. Maybe next time. This entry was posted in Uncategorized and tagged charities, empathy, math, new ideas, students on October 28, 2013 by Danny.